Mangane is one of the impoverished communities in Mozambique where the majority of people have no job opportunities, and resort to farming as their daily activity for survival and to sustain their families. Luckily, it is a community where sponsorship programs such as Basic Education, School Health and Nutrition, Early Childhood Care and Development, and Adolescent Development are all being implemented. Prior to Save the Children sponsorship, the school dropout rate had been increasing because parents and caregivers did not value education. A total of 283 children were enrolled in school in 2013, and in 2014 that number has increased to 392, demonstrating an increase of nearly 40%. The sponsorship program helped community mobilization and bringing community leaders to play a role in children’s education. 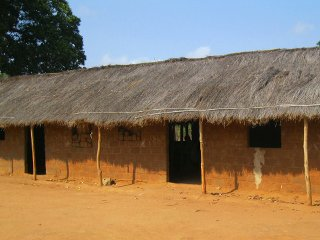 Mangane had only three poor classrooms, both uncomfortable and with unsafe conditions for both children and teachers. 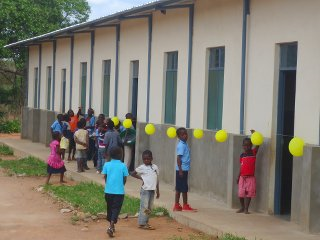 However now with the help of sponsorship funds, the community has four new conventional and furnished classrooms and an administrative block, as well as improved and separate latrines built for girls, boys, and teachers. Save the Children is also providing sports equipment to ensure that the school environment is fun and friendly! Abacar Fadil, is a community leader from Mangane, testified in his own words, “… My name is Abdul Fadil, I am a community leader and also a school council member. I know for sure and see how fast Mangane Primary School changed. A high number of children at school is now visibe from the time [Save the Children sponsorship] came to implement programs in our community. Awareness on parents and caregivers was raised in order to make them understand the importance of school.